If you are traveling to Ireland at high season and don’t fancy joining the crowds that converge on Kerry, head north to Donegal instead. In fact, don’t worry about the season, consider this option anyway. Donegal has far fewer tourists, is fabulously beautiful, and Glencolmcille is one of the most spectacularly lovely places you’ll ever visit. You won’t find many visitor centers or commericialised attractions, this is a place to enjoy cliff and mountain walks, to spend time exploring secluded beaches. There is good sea fishing, from the pier or beach. Less well known than St Patrick, St Colmcille brought Christianity to the north-west corner of Ireland and the area is named, and its annual pilgrimage held, in his honour. 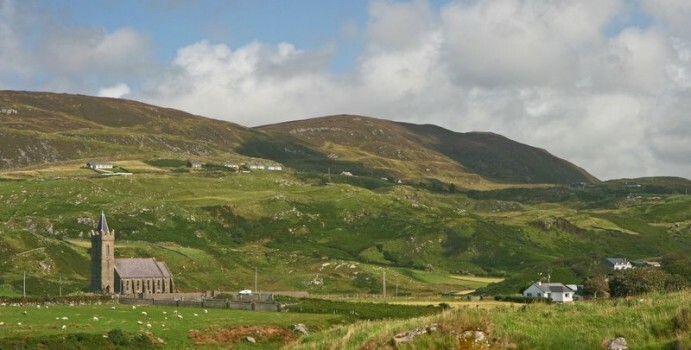 The pilgrimage at Glencolmcille takes place on the on the night of June 9th, starting after sundown. Pilgrims cover a 5km route, with 15 stations where rituals must be observed, and complete their journey before sunrise. 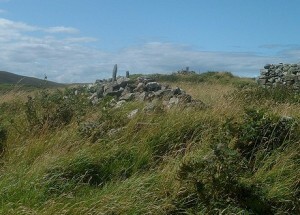 The pilgrimage route is rich in megalithic remains, some dating back more that 5000 years, and it is believed that the current pilgrimage occurs on a site where pagan ritual was commonly observed, indeed some of the structures that act as ‘stations’ on the route are certainly pre-Christian. 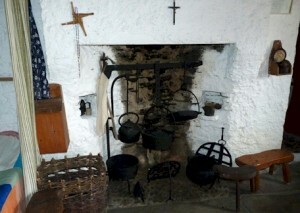 The Glencolmcille Folk Village Museum is a museum of domestic life in Donegal which differs from others of its kind in that it is entirely owned, run and staffed by local people. The main part of the village is a cluster of small cottages, known as a “clachan”, each from a different period of Irish history, with examples from the 17th, 18th, and 19th centuries. The cottages are filled with household implements, kitchen utensils, furniture, pictures and clothing of the time, all of which were originally owned by people in the area. There is also a reconstructed school house, a sheebeen (an illegal pub!) and a tea room/craft shop displaying the works of local artists, knitters, and weavers. There are many craftspeople working in the area, predominantly producing Aran knitwear, tapestries and woven wool – Donegal has a long tradition of textile work, its tweed in particular is renowned internationally.